Dr. F.-E. Wolter has been a full professor of computer science at Leibniz Universität Hannover (LUH) since the winter term of academic year 1994-1995, where he heads the Institute of Man-Machine-Communication and directs the Division of Computer Graphics and Geometric Modeling called Welfenlab. 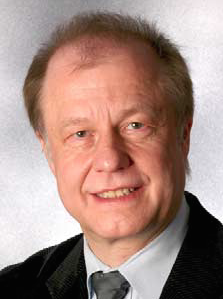 Before coming to Hannover, Dr. Wolter held faculty positions at the University of Hamburg (in 1994), MIT (1989-1993) and Purdue University (1987-1989). Prior to this he developed industrial expertise as a software and development engineer with AEG in Germany (1986-1987). Dr. Wolter obtained his Ph.D. in 1985 from the Department of Mathematics at the Technical University of Berlin in the area of Riemannian manifolds. In 1980 he graduated in mathematics and theoretical physics from the Free University of Berlin. At MIT, Dr. Wolter co-developed the geometric modeling system Praxiteles for the US Navy. Since then he has been publishing various papers that broke new ground applying concepts from differential geometry and topology on problems and design of new methods used in geometric modeling and CAD systems as well as shape and image analysis. This work includes pioneering contributions on medial axis theory, the computation of medial axes and Voronoi diagrams and geodesics in Riemannian space as well as pioneering work on Laplace spectra as finger prints for multi-dimensional geometric objects and images with applications in biomedical imaging. The work on Laplacian operators recently lead to computational studies on generalizations of Laplacians operating on line bundles allowing to compute eigenfunctions whose iso-surfaces yield smooth orientable and non-orientable Seifert surfaces in three-dimensional manifolds. Dr. Wolter's ongoing research on computational Riemannian geometry still pursuing issues for for computing geodesic joins, geodesic Voronoi diagrams, medial sets etc. include now formerly unsolved difficult singular situations caused by singularities of the geodesic exponential map. The latter efforts include now delicate numerical computations of conjugate loci or more general focal sets in Riemannian space. This work has been helpful for Dr. Wolter´s recent presentation of new methods in the context of computing, analyzing and visualizing the singular behavior of non-linear dynamical systems related to differential algebraic systems. Those new results include efficient global numeric parameterization methods for general implicitly defined manifolds, solving an apparently open global problem. During the last decade research on Virtual Reality systems with an emphasis on haptic and tactile perception has been a subject of Dr. Wolter's research in Hannover. More recently, his research includes the development of medical imaging systems and bio-mechanical simulation systems including hearing mechanics of the cochlear.